Sam Schmidt sits in front of his customized Arrow racecar. Before the start of the 2000 Indy Car Series while practicing in Orlando, Florida, Schmidt crashed and was rendered a quadriplegic. A team of engineers uses a hoist to load Sam Schmidt into the car before he heads to the track at Sonoma Raceway. The SAM car takes a lap around the two-and-a-half-mile oval at Indianapolis Motor Speedway. Early in the program, the sensors that control the car were mounted to a black baseball cap that Schmidt wore. These eight white sensors together with a trunk full of unseen technology enable Schmidt to steer the car. He controls speed and braking by blowing into the clear tube. Arrow staff surrounds Sam Schmidt at the Indianapolis Motor Speedway, where he reached a new top speed of 152 mph. Outside Sonoma Raceway, a visitor inspired by Sam checks out the SAM car. A peek into the trunk of the SAM car. Arrow uses sophisticated computers, GPS technology, cameras and sensors to transform an ordinary Chevy Corvette into the SAM car. Arrow brought the SAM car to Washington D.C. to celebrate the 25th anniversary of the Americans with Disabilities Act. Here, tourists check out the car at the National Mall. Arrow Electronics CEO Mike Long drops the green flag as the SAM car starts a run up the Pikes Peak International Hill Climb. 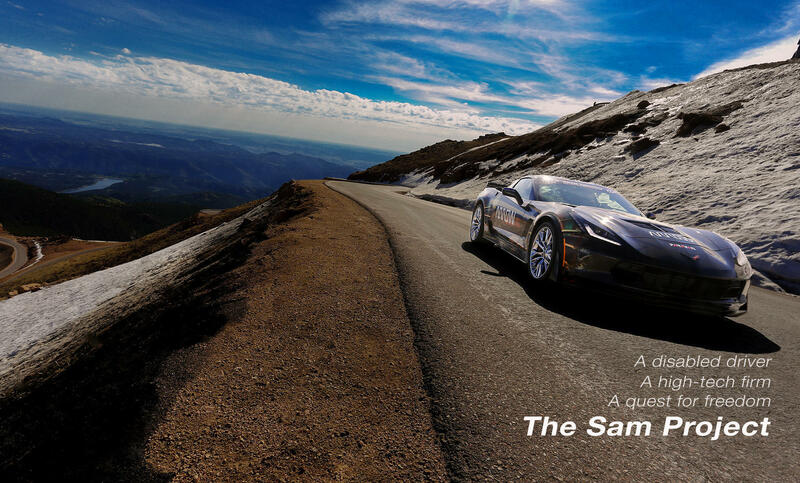 Previously, Schmidt drove the Arrow SAM car to the Pikes Peak Summit in 15 minutes and reached a top speed of 80 mph. Chakib Loucif, who worked in Arrows engineering division, helped design the SAM car. Here, he talks with Sam Schmidt before a test lap at the Pikes Peak Hill Climb in Colorado. Sam controls speed, acceleration and braking with a special breathing tube. Here, he tests the tube before driving at Pikes Peak, Colorado. Sam Schmidt pilots the 2014 Chevy Corvette around the 2.5-mile road course at Sonoma Raceway. The California course features 12 turns on hilly terrain with 160 feet of total elevation change. An Arrow engineer runs a series of tests before Sam begins the climb at Pikes Peak, Colorado. At Sonoma Raceway, Sam expected to finish three or four laps on the 2.52-mile road course. He surprised everyone by completing seven. Sams wife Sheila takes a family snapshot. Sam talks to the media immediately after his SAM car race at the Indianapolis Raceway with Andretti, the 77-year-old racing legend. With the famous Indianapolis Motor Speedway Pagoda in the background, Sam drives the SAM car through pedestrian traffic from the garage area to the track. Mario Andretti has a laugh with Sam after the pair staged an exhibition race where they both drove semi-autonomous (SAM) cars in May of 2017. NBC Today Show correspondent Harry Smith interviews Sam before jumping in the car for a drive through morning Manhattan traffic. Sams children were very young when he was injured, so he was never able to drive them in a car like he had hoped  until the morning of August 27, 2017, when Sam took his kids on a tour of Washington D.C. in the Corvette. Here, Sam drives past the U.S. Capital with his daughter Savannah in the co-pilot seat. The Capitol provides a perfect backdrop for the SAM car at sunrise, as Sam and Savannah prepare for their drive through the streets of Washington D.C. The SAM car works its way through the morning D.C. traffic with a view of the Thomas Jefferson Memorial in the distance. The Franklin Delano Roosevelt Memorial had special importance to Sam, along with his kids Savannah and Spencer. The trip to Washington, D.C. was more than just sightseeing for Sam. Here, Sam speaks to technology and policy leaders about how adaptive technologies like the SAM car can improve the lives of our our nations wounded warrior community. Sam and the team from Arrow traveled to Nellis Air Force Base in Las Vegas, Nevada, to be part of its air show celebrating Veterans Day. As the sun comes up over the mountains, Grace Doepker, an Arrow engineer, prepares for the hundreds of visitors who will stop by the Arrow Booth to learn about the SAM car. Sam in a quiet moment before entering the air show. Sam's daughter Savannah pokes her head into the SAM car to wish him good luck before he drives out. - Even though Sam can send the car careening down the track at 100 mph, it still takes a hydraulic hoist and a team of people to get him in and out of the car. Sam's wife Sheila helps make everything possible, including a phone call. As the SAM project has developed, Sam has been able to drive the car at much faster speeds. The ball cap he once wore has been replaced with a helmet which incorporates the sensors that allow Sam to turn the car as he moves his head. Arrow Electronics created this 2.25-inch challenge coin to hand out at events. The message on the backside: Be the driver of your life. ©2018 Copyright Scott Robinson. All Rights Reserved.